Melody Lavin challenges pastors, worship leaders, music ministers, choir directors and worship team members in her new book To None But God. True worship and anointed teaching from God’s Word are the power team that God uses to encourage and equip His people. When we get past ourselves, our personal agendas and the song set list, and we allow God’s Spirit to direct our worship of the Father God, we connect with Him. 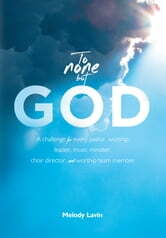 To None But God shares how to get there. The author presents 8 challenges that lead to an honest evaluation of self. She follows that with an activity to evaluate lyrics used on a consistent basis in worship sets and how they line up with Scripture and scriptural definitions studied in the book.